Note, this guide has been updated since the original written in October 2015. This guide aims to help Dungeons & Dragons 5th Edition DMs run narrative "theater of the mind" style combat. This style of combat doesn't require a battle map or miniatures. Instead DMs and players describe their actions in combat either completely vocally or with rough sketches and other visual aids. To learn more about why we want to run combat in the theater of the mind, please read the Tyranny of the Grid. You can download, print, and discuss the core concepts of this style of combat with your players using this One-Page Guide to D&D 5e Narrative Combat. 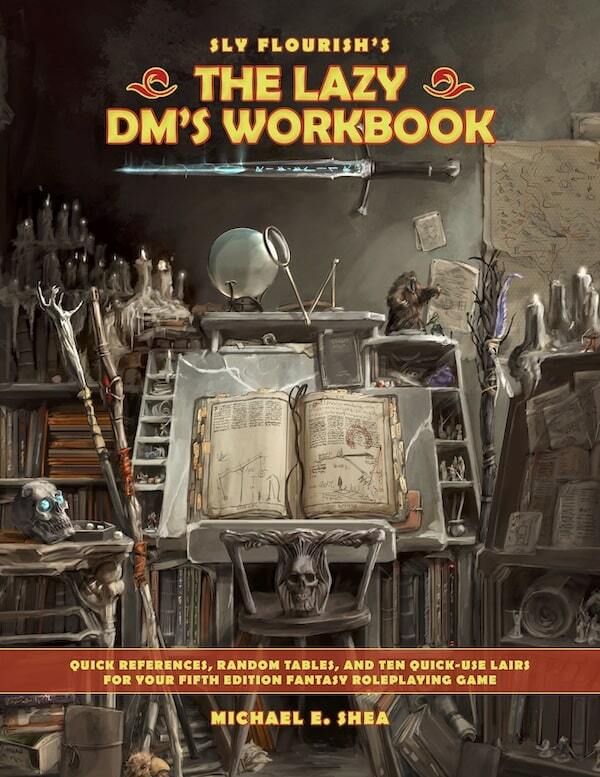 You can also download a copy of the two-page Guidelines for Theater of the Mind Combat from the Lazy DM's Workbook. For those used to running D&D games using a gridded battle map and miniatures, running narrative "theater of the mind" combat can feel both terribly strange and strangely familiar. If we're used to running combat on a 5 foot per square grid, the switch to combat in the theater of the mind can easily make us feel like something is missing. How can we really know what's going on in combat if we can't see it? 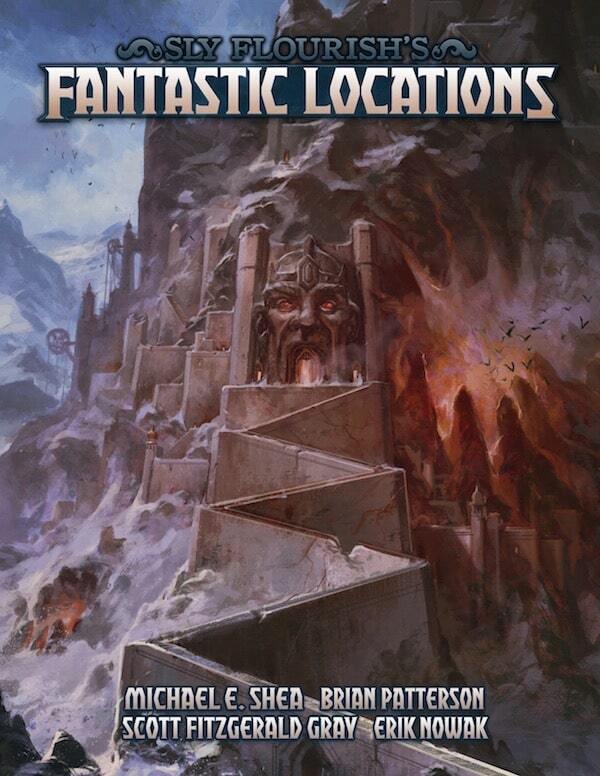 The answer lies in the other two pillars of our D&D game—exploration and interaction. We don't set up battle maps and lay out miniatures when our characters have a discussion with an NPC. We likely don't set up a big map and start counting off squares when the characters explore an ancient ruin (although we can!). We don't have visual queues when we're describing how a thief narrowly avoids a poisoned pin while attempting to disarm a lock. Outside of combat, all of the rest of our D&D game runs on the premise that a DM describes the situation, the players describe their actions, and dice are rolled. Combat doesn't have to be any different. Even knowing this, actually running narrative combat can feel strange to us if we're used to the map and minis. A Focus On Intent: "What Do You Want To Do?" 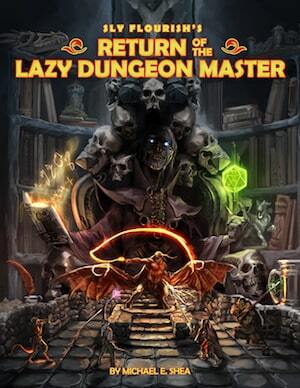 The DM describes the situation, the player describes what they want to do, and the DM adjudicates how they can do it. The DM narrarates the results of the adventurers' actions. When players describe their intent and dungeon masters adjudicate the situation based on that desired intent, combat runs fast and furious. In order for this to work, the player must trust the DM to adjudicate fairly and the DM must maintain that trust by doing so. 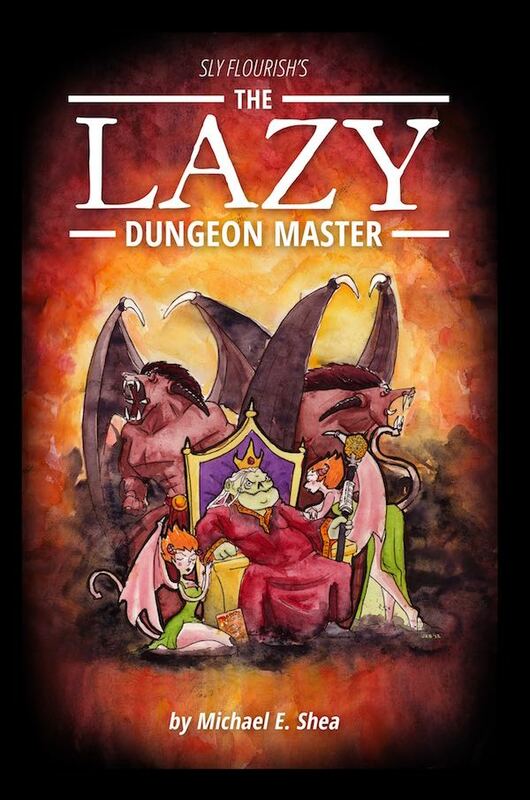 In general a DM should steer in the PC's favor when handling edge cases as long as it is within reason (for a fantasty action game) and is fair to the capabilities of the other characters. Different situations will call for different rulings. Sometimes a fireball may take out only four kobolds while another time it will take out twenty. A lot of variables can change these guidelines and these changes should be made clear before PCs commit to any given action. If players feel screwed out of their turn because the DM decided their action isn't as effective as they thought, that player won't trust the DM's judgement. They'll feel like they got screwed because they couldn't play it out on a grid. In general, when running combat in the theater of the mind, players should have the option of changing their minds if their results aren't likely to meet their intent. The DM describes the situation and highlights any notable features of the location. This includes describing where monsters are, what they're doing, and any other information that will aid the player in understanding what actions they can take. We roll initiative just like normal. Players describe their intent. "I want to run up to the lead orc and smash him in the face with my war maul." Sometimes DMs need to clarify the situation. "There is a long flaming crack in the ground between you and the head orc." Most of the time, we say "sure, awesome!" Dice are rolled. Both the DM and the players can describe the results of their actions. "Your maul cracks into the orc! How does he die?" "My maul hits with a sickening crack and the orc falls back into the flaming crack!" On each characters' turn, the DM clarifies their circumstances "Asharon, it's your turn. Thargon just smashed an orc in the head but two of the orc's friends are still on the other side of the crack firing arrows at you. An ogre also rushed in, lept over the flaming crack, and is nearly on top of you. What do you do?" On the DM's turn, the DM describes what the monsters do, who they attack, and how. "Thargon, both orcs fire arrows at you after seeing you slay their friend. Asharon, the ogre rushes forward and attempts to smash you to pulp with his huge club!" While each character race has a different movement speed, we can abstract this movement out without losing much of the high fantasy feeling of D&D. In general, when a dungeon master describes a situation, they can describe how many moves it will take to reach something. Many times this will be one move (who really wants to spend three rounds moving up to the bad guy?). Whether it's a dwarf or an elf, it can still be one move. Certain classes have clearly superior movement speeds, like monks and rogues. In this case, that character can clearly move further than others. If it would normally take two moves to get up to a back-line enemy, for example, a monk can do it in one. Since we're describing entire battles using in-game action-packed narrative, we can describe how quickly the monk darted through the enemy's lines in comparison to the dwarf's rushing charge. As we run combat in the theater of the mind, we give preferences and liberties to characters who move quickly when compared to those who move slowly. When characters engage in melee combat, we can make the assumption that they are within five feet and risk opportunity attacks if they try to move to another enemy or somewhere else. If a character wants to get within five feet of more than one enemy, the player can state that intent and the DM can adjudicate how many enemies that character might engage. Most likely this is two. Likewise, when the DM runs monsters, they will describe who the monster gets close to so the player will recognize that their character will take an opportunity attack if they try to move away. This is one area where miniatures can help out quite a bit. Even though we aren't concerned with specific distances, we can show the relative position of monsters and characters with miniatures on the table so everyone can see. It's not required but it can certainly help. All ranged attacks have a fixed distance described in the Player's Handbook. Like much of the rest of our methods for running combat in the theater of the mind, we abstract these ranges. Most of the time any ranged attack can hit an enemy. Only if the DM has clearly described that a particular enemy is really far away (more than fifty feet or so) can we make the assumption that shorter ranged attacks won't hit. Like fast movement, players may have spells, weapons, or abilities that can hit from very far away. Many times we can make these long ranges part of the story we tell. Small areas: 2 creatures (thunder wave, burning hands). Large areas: 4 creatures (cone of cold, fireball, darkness). Huge areas: Everyone (earthquake, circle of death). Short lines: 2 creatures (wall of fire). Long lines 3 creatures (lightning bolt, blade barrier). Players and DMs should use these numbers as the baseline expectation for how many creatures they are likely to hit with a spell of this size. Different situtations might allow an area to hit more targets than the above numbers. In particular, players might negotiate with the DM to see how they can hit more than this number if the situation is right and if they are willing to take a risk. For example, while a mage may position a fireball to hit four orcs, they might be able to add two more if they are willing to put the barbarian ally within the blast. Abilities like "shape spell" or a sorcerer's metamagic feats might let a caster hit more targets without such a risk. The DM describes which features of a location might act as cover or block line of sight between characters and monsters. One of the best ways to see narrative "theater of the mind" combat work in play is to watch videos of DMs running narrative combat on Youtube or Twitch. Chris Perkins often uses theater of the mind combat when running his Acquisitions Incorporated games. Even with the huge set-piece battles he runs, he still abstracts distance and movements to focus on the high adventure of a battle. Chris also runs combat completely in the theater of the mind in his Dice, Camera, Action game. Will Jones from Encounter Roleplay uses narrative combat exclusively in his Twitch games. Matt Mercer, during his Force Gray games, uses a mixture of maps and theater of the mind when running combat. 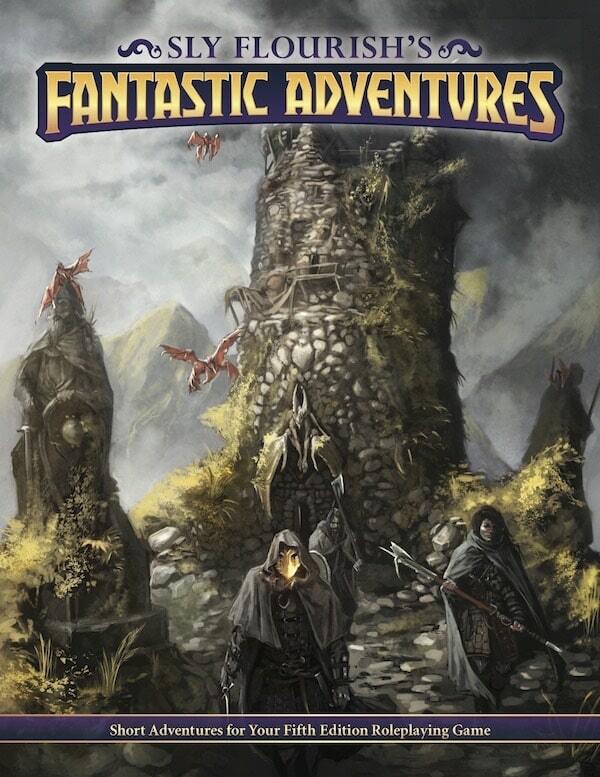 All of these can help you get comfortable with the concepts of focusing on the high fantasy and adventure of D&D while not worrying about the minutia of the 5 foot square. It is possible to run combat in the theater of the mind with no physical aids at all. Table aids, however, can help everyone understand what is going on. This might be everything from a quick sketch on a piece of paper to an elaborate arrangement of 3d terrain and miniatures. Even if we do end up with a beautiful map, we can still abstract the distances and describe actions using in-story descriptions. Pathfinder Flip Mats by Paizo are one of the best aids for running D&D games. Though gridded by design, it is easy to ignore the grids and use the surface of the poster map to write out all sorts of information such as the names and characteristics of enemies, current damage on those enemies, enemy AC once it's clear the characters know it, and all sorts of other information. The blank dry-erase poster map is an incredibly useful and versatile tool for running D&D and a great investment. As mentioned earlier, miniatures for the characters can help everyone keep track of what monsters are in the fight, who might be within 5 feet, and who is in the back row of a fight. When using a dry-erase poster map like this, its important to clarify to your players, before battle begins, that there is no fixed distance on the map. As mentioned before, players should tell the DM what they want to do and the DM should tell them how they can do it. Focus on intent. Because we're running an abstract battle, it's important that we avoid taking advantage of the lack of specificity by letting our monsters gang up on the characters. Good narrative combat will only work in a group if there is trust between players and DMs. We can build up this trust and avoid favoritism by randomly selecting who gets attacked by our enemies unless there's a good clear reason why one monster would attack one particular character. If not, choose the character a monster attacks randomly by rolling a die as close to your number of character as possible and have the monster attack that character. When you roll this way, roll it in the open so all of the players can see why one character got attacked over another. Sometimes this might mean one character gets ganged up on, but everyone at the table will know why. Monsters aren't idiots though. If it's clear to both you and the players that a monster would attack a particular character, such a concentrating wizard, the monster will clearly do that. Many intelligent monsters will know to take out enemy spellcasters and healers as quickly as possible. When this happens, we can describe why that monster chose that character, helping players understand why one particular character was attacked over another. If it doesn't make sense to them, they might feel picked on and begin to lose the trust that is so vital for running combat in the theater of the mind. It's hard to identifying particular enemies in the theater of the mind if you can't tell one from another. One effective way to identify particular enemies is to ask your players to describe the physical characteristics of the enemy they're targeting. This has many advantages. First, you're opening up the player's imagination and getting it away from simple game mechanics. Second, you're removing the burden from your own shoulders. We DMs have enough to worry about. Third, it helps everyone at the table identify particular enemies without stepping outside of the story. Fourth, it's very easy to do. Just ask your players to describe interesting physical characteristics of the monsters they hit. When they give you a physical trait, write it down on a 3x5 notecard or on your dry-erase flip mat so everyone can keep track of this newly identified enemy. A round hill that is actually a huge iron demon skull half buried in the ground. Jagged cliffs on the side of a mile-high waterfall lost deep in the fey woods. The edge of a chasm that pierces from our world into the depths of hell. The shattered deck of an airship mysteriously buried in the middle of a mountain. The remains of a sunken cyclopean temple shaped like a long-dead god. A block of dwarven iron floating in the molten center of a volcano. High above the city on the back of angry griffins and screeching vrocks. During the fight, take time to describe the actions monsters take. Ask players for their own descriptions of their actions. Go with the famous "describe your killing blow" to move players from mechanics into storytelling. Rich and evocative descriptions are the key to making a narrative battle feel as fun and interesting as one with detailed maps, terrain, and miniatures. Give these descriptions the attention they deserve before and during the game. 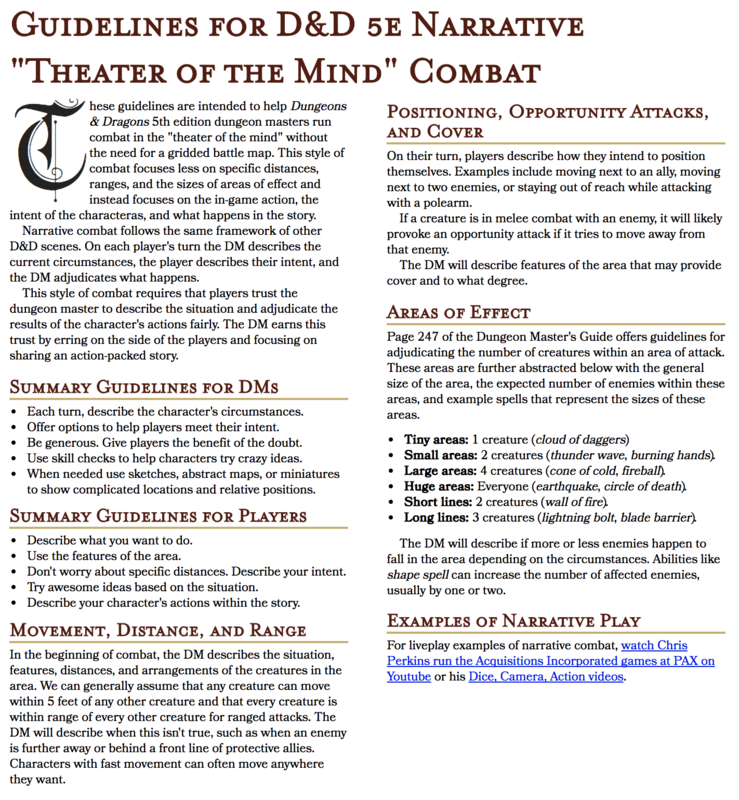 These guidelines for combat in the theater of the mind are just one tool you can use to increase the enjoyment of your D&D game. If you find them useful, use this one page reference for narrative combat and hand it out to your players. You don't need to use them all the time. Instead, use these guidelines to give yourself options for running fast combat described using in-fiction language to build fun, dynamic, and action packed stories.